Tone Lanzillo is a mental prep coach to athletes who want to be mentally prepared to play their best game. He has worked with student-athletes, from middle school through high school and into college, in such sports as basketball, football, soccer and lacrosse. Over the past several years, he has written for a number of sports blogs and websites, including FirstDown Playbook, Coaches Training Room, Ultimate Hockey Source, and Lax Playbook. For any basketball coach out there, whether you coach at the youth level, in high school, in AAU or at the collegiate level, I encourage you to watch the Villanova men's basketball team play in March Madness. While many are talking about the star players in the NCAA tournament or which team has the best statistics, the players on the Villanova team are definitely a team to watch given their "toughness of mind" and "collective attitude". Whether or not they win the NCAA national tournament this year, there is so much that we can learn from watching how the players on this team mentally play the game. 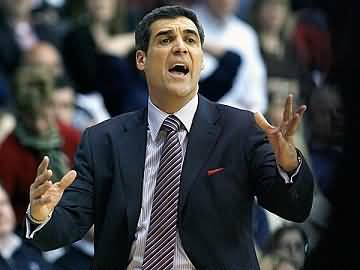 You can see that head coach Jay Wright and his staff have coached and taught this team to play with poise, a sense of purpose, passion, presence of mind and to play big - playing for the greater good - their team. No matter what happened five minutes ago or could happen ten minutes later, these players appear to keep their attention on what is happening in the moment. They are very focused on now. Never do you see them negatively react or over react to any challenge or mistake on the court. As I have read in various interviews, the Villanova players look at every moment as a teaching moment, and therefore, they know that they can learn from any experience to become better players and a better team. They never seem to be overwhelmed by anything that is happening in a game, and look as if they are able to slow the game down in order to give themselves the opportunity to play smarter and with more successful outcomes. The Villanova basketball team has players who know how to play to their strengths, and to use these strengths to support and empower their teammates. From listening to them talk in the media, they are definitely concentrating on how each of them can play a supportive role in helping the team play their best games in this national tournament. They see the value of being selfless in playing for their team, and seem to have figured out how not to be self-centered to the point where it could destroy the chemistry that they have developed during the season. For all of us who coach or mentor basketball players, we need to watch the Villanova men's basketball team play and perform on the court. Pay attention to what they are doing at any given moment of a game. Watch how they respond and deal with any difficult or challenging moment on the court. See how these players maintain their concentration, composure and confidence -whether they are down or up on the scoreboard. Appreciate their consistency in how they mentally approach the game and their "toughness of mind" and "collective attitude" from the opening tip off to the final second of a game.